Shanghai's importance in China's history is short, but for me powerful. Not really the history, but the images that emerged of an exotic, cosmopolitan society where Russians and French and Americans rubbed shoulders with Chinese culture. Like all border towns, it was decadent. Or so it seems in movies like "Shanghai Express" with Marlene Deitrich or Bartle Bull's novels set in that era. But you cannot find old Shanghai. It is gone but for a small area only part of which I saw. 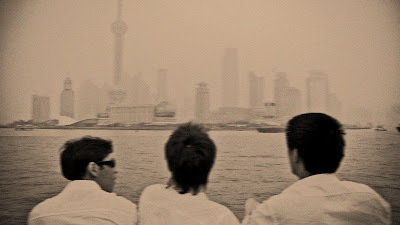 The Bund. 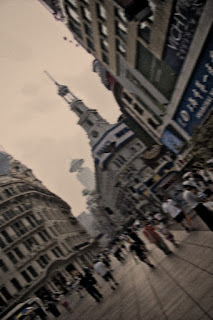 There are a few colonial buildings standing, a few old mansions, but Shanghai is a modern city looking forward, not back. 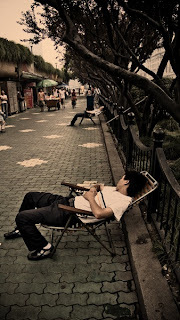 Along the Bund, scammers look for hapless tourists, but it seemed no worse than any other big city. People strolled about and shopped in the large outdoor mall a few blocks away, and people were exceedingly friendly. There were groups of young Chinese, art students, they would say, at the University in Xi'an, who would stop you and engage in chat. They would ask if you wanted to come see their exhibit just a few blocks away. I would always talk for a minute and then pull out my Polaroid camera and soon we were all having fun. Some of the group, however, had read that these "students" would lure you into a bar where they would order drinks that were hugely expensive or that they would take you down an alleyway where you might be mugged. The guide books say that you should not talk to anyone who approaches you on the street and wants to practice his/her English skills. And of course, others on the tour came back with harrowing tales of being taken from building to building in search of the art exhibit before they realized what was happening. "Shanghaied" flashed in their incredulous eyes. Being a foreigner in a far away place can be unnerving, I guess, but I never felt much danger. 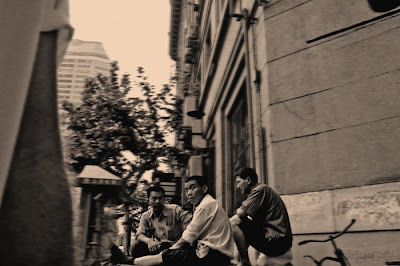 Once when I was walking through an alleyway in a hutong, I saw a group of men and felt my spine tingle, but who knows if there was any danger there. I told my companion to turn around and we left without incident. Often enough the men would stare and I would raise my camera and gesture and they would either say yes or no. Sometimes a rough group of workers would gather about and laugh as the Polaroids shot out, obviously making fun of whomever was in the portrait. Somewhere along our tour, I asked our guide if it would be possible to rent a car or driver and go into the country to photograph all the things I was seeing through the windows of the bus. He told me that it would be dangerous, that the villages were controlled by the mafia and that I would not be welcomed warmly, that indeed, I "might be overwhelmed." Lovely phrase. 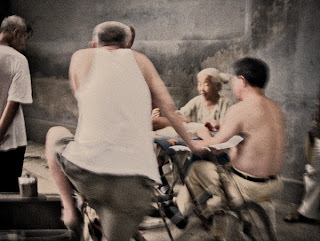 When I got home from China, I wrote to a photographer who has a wonderful book about China, and recounted this story. Here is his reply. or trying to ensure you stay with the program. then wait by the side of the road when done to return. issue during daylight, especially in the countryside. looking foreigner. So, I keenly fullfill that roll. I am certain, though, that is what you would have guessed.